This is my team franken pot. I made this with Dakota and Jaden. I made the top, Jaden made the middle, and Dakota made the bottom. It is kind of lop sided, but it gives it a cool look. The colors that are used are sydneys blue and i believe a black or a dark cobalt. I think that the galzes play with the movement of the pot its self, and the overall mood is kind of like the ocean. This is my second semester Multi Wheel project. Originally it was supposed to be my set of three but I footed through one of the cylinders so I decided to connect the two instead of just throwing the whole thing out. I wanted to give it a vintage earthy vibe when I glazed it and i think I achieved that. I first dipped the whole thing in dream green, and then I dipped the top in a cobalt and the bottom in black. It gave the pot movement that i really like. These are my first projects of the second semester. They are probably two of the best plates I've made so far. although one is too thin and and the other is too thick, they are still two really good plates. One was glazed in a shadow green and the other in a dark cobalt. They are both very semetrical and they give off a very calm earthy vibe. This is my closed form project. It is my second closed form, but I still hate making them. I used seamix to make the project and it took me about a day to do. Shaping the project this time was fairly challenging, partly because i think the middle of the project was a little thin. For glaze i used the iron tan and I'm not a huge fan of how it turned out. The inside is a blue that again, didn't coat well. But over all it fits the earthy theme that i have been going for. 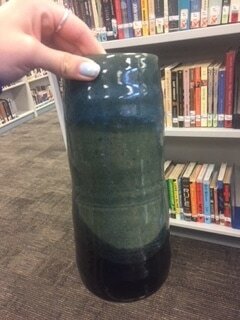 This is my lidded project, and this is the only picture that i can post of my lidded project because the glaze ran and the lid and body of the project stuck together, and when I went to take it apart it broke the body. But other wise it was a very well put together. I used shadow green on the outside and a light blue on the inside. The outside glaze went on very well, but the inside glaze didn't coat well. Before it broke, it gave me a calm foresty vibe. This is my second choice project. It is a cone 10 clay with cone 10 glazes. I really wanted to make something different and unique, so i decided to change the shape of the vause from a circle to a square. It was pretty challenging to shape it because it almost threw the whole project off. For the glazes, on the inside I don't know what color it was, it was a vibrant red but turned out as brown. On the outside I used a milky white and I am really happy with the way it turned out. This project gives me a very calming earthy vibe that I have been going for. This is my first choice project. It was supposed to be the bottom to a moon jar but it dried out too fast so i just footed it and used it as a bowl. It is cone ten so i glazed it with cone ten glazes, but it was put into the wrong kiln so the glaze turned out thicker and a different color than they were supposed to be. But i really liked the way the color turned out in the middle. The bowl gives me a very earthy vibe.